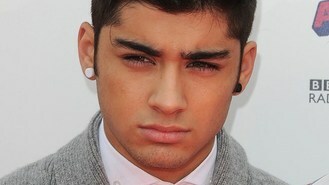 Zayn Malik has told how he felt a tad nervous when he visited girlfriend Perrie Edwards' family for the first time. The One Direction star, 19, recently went to meet the Little Mix singer's relations in Newcastle. He told The Sun: "I was a bit scared of her brother to be honest - he's in the Navy. He's a big bloke. "I thought he was going to be a bit defensive of his sister but he was really cool." The heartthrob said it was tough spending so much time away from his family, and missing out on seeing his three younger sisters grow up. He said: "It's been really hard. Last weekend was the first time in six months that I'd been home. "It's pretty strange because you have images of people in your head when you left, then you just think they're going to be the same when you come back, like time freezes. I have sisters and from the ages of 11 to 13 - it's a big change for girls." Girls Aloud are reportedly back together and recording a comeback single. The Military Wives' choirmaster described the group's prize win at the Classical Brits as "the candle on the icing of a very large cake". Sir Anthony Hopkins found himself with a share of a Classic Brit Award after one of his compositions featured on the album of the year. Taylor Swift has revealed she "can't wait" to perform at the MTV European Music Awards. One Direction's Liam Payne has revealed that he would still like to be friends with ex-girlfriend Danielle Peazer. James Bond fans have welcomed Adele's "classic" theme for the latest 007 film after a short clip was released online. Long-forgotten footage of The Beatles visiting a chip shop as they filmed their surreal road movie Magical Mystery Tour is to be seen for the first time. Adele said she was "hesitant" about recording the theme to the new James Bond film Skyfall. Adele has confirmed she will sing the theme to the new James Bond film Skyfall, meaning the worst kept secret in music is out.